How can making a city more walkable improve early childhood development? In 1950, 30 percent of the world’s people lived in cities. Today, that figure is 50 percent. By 2050, nearly 7 in 10 will live in cities. Planning and managing cities has become one of humanity’s defining challenges, yet it is hard to know how to plan for what a city needs now and in the future at the same time. What can we measure to determine if a city is functioning well for its residents today and is likely to live up to its full potential in the long run? One answer: The daily life of a toddler. We have strong evidence that a safe and nurturing environment during pregnancy and the first five years of life can translate to better adult health outcomes, greater ability to learn, and higher lifetime incomes. By designing cities that work for toddlers now, we improve their lives and those of their parents, teachers, and doctors immediately and we are making an investment that will help create safer, more prosperous cities 20 years down the road. With this view, the Bernard van Leer Foundation recently launched Urban95: a five-year initiative through which we will partner with city leaders and urban planners around the world to look at their cities from an elevation of 95 centimeters – the average height of a healthy three-year-old – and incorporate the resulting insights into city planning, design, and management. One issue that has come up in our partnership discussions in cities from India to Israel to Brazil is walkability. City leaders want to make it possible for people to walk to healthcare clinics, childcare centers, and places to play—locations where parents with young children frequently need to go. Anyone who has been pregnant, had to board a bus with a stroller, tried to steer a group of toddlers through a metro transfer, or sat in traffic late for childcare and late for work will understand: Transportation can be uncomfortable and stressful. This can be partly addressed through better design. But it would be far better tackled by avoiding cars, buses, and metros altogether and making it possible for parents with young children to walk to what they need. From a child development standpoint, walking brings a potential windfall of benefits. First, walking is exercise. For children and parents. Second, walking is free. A trip to the park to play no longer feels like a financial trade-off when a low-income family constantly trying to make ends meet doesn’t have to pay the bus fare to get there. Third, walking can save time. Parents don’t need to get an early start to make sure they don’t miss the bus or to avoid commuter traffic. Time saved can allow parents and kids to sleep more, prepare a healthy breakfast, or increase opportunities for talking and play. These and many other important child development activities are often forgone or cut short when time is scarce. The Harvard Center on the Developing Child argues that successful parenting of young children demands core capabilities such as planning and self-control that become much more difficult to practice when life is chaotic. Making routines more predictable for parents allows them to focus their energy on activities that nurture healthy child development—having an engaging breakfast conversation, practicing patience with a crying toddler, or telling their infant a story. In our first six months working on Urban95, we are finding that most of the previous work in city planning for kids has focused on older children. Nonetheless, we are connecting with inspiring experts and partners who have great ideas about how to help parents with young children walk to what they need. Cities are finding ways to bring services within walking distance of where families live. For example, in India, the state government of Odisha is requiring that 2 percent of land in new low-income housing projects be allocated for community services, including preschools and childcare. In Hong Kong, developers are permitted to increase floor area ratios (expanding the commercially viable space per building) in exchange for embedding small “pocket” parks in their designs so residents have green space nearby. In Maranhao, Brazil, 17 cities are using private homes as meeting points for pregnant women and health workers. Locations are chosen to be close enough for the parents-to-be to arrive on foot. This results in fewer missed pre-natal visits and more time spent helping moms and dads think through what steps they can take—before and after the birth—to help their children thrive. 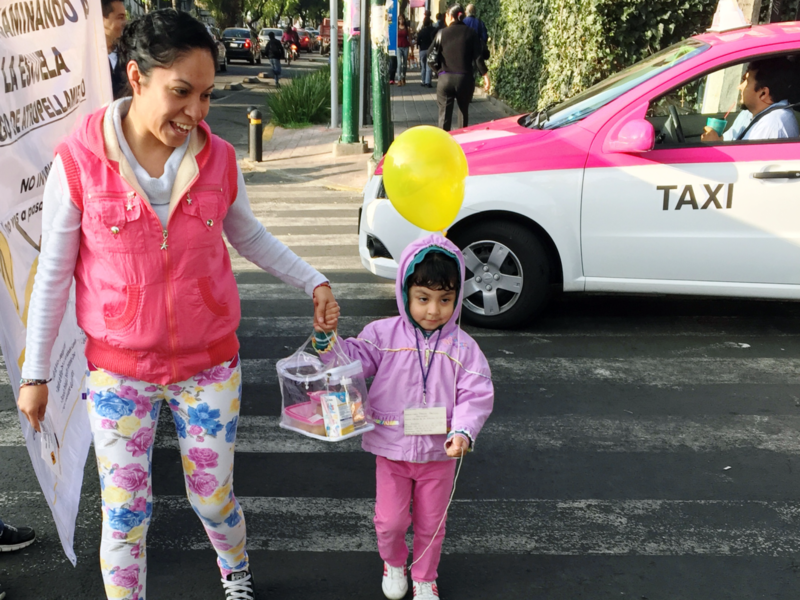 Cities are also making walking routes safer for parents and young children. For example, Barcelona is in the process of introducing superblocks—small areas (e.g. nine square blocks of 5000 residents) around which traffic will flow, but within which traffic will be heavily restricted, thereby making it safer to walk. Meanwhile, Medellin, Colombia, has introduced safe routes for preschoolers who live in neighborhoods with high levels of gang violence. Children walk to school together with a group of adults, playing games and accompanied by music. And cities are tracking indicators to aid in policymaking about the importance of having services nearby for early childhood development. For example, in the Flemish region of Belgium, the government runs an observatory that tracks metrics such as the percentage of children between 2 and 5 that live within 400 meters of a kindergarten and the percentage of children under 11 that live within 400 meters of a play area. The American writer Kurt Vonnegut famously explained why he insisted on walking to the post office to buy an envelope instead of buying 100 all at once and sticking 99 of them in the closet. Along the way, he would meet a lot of people, give a thumbs up to the passing fire engine, ask a woman what kind of dog that was, and have “a hell of a good time.” Beyond the savings in money, stress, and time that comes when parents can walk to what they need, there is also great value in the walk itself. 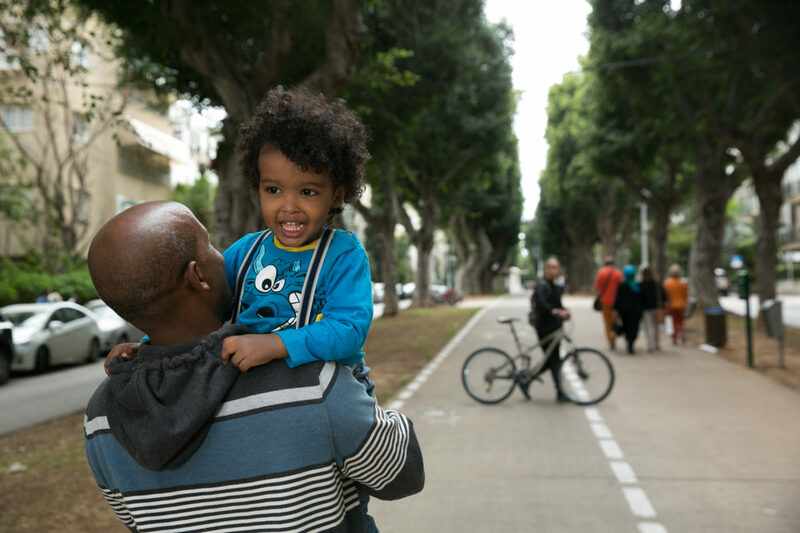 The walk can be a time for parents and children to talk, to play games, to sing songs, and to connect with their neighbors. Seen from an elevation of 95cm, it is a potentially infinite string of teachable moments waiting to be discovered. This post originally appeared on the Stanford Social Innovation Review (SSIR) as part of the Preparing Today’s Youth for Tomorrow’s World series produced in partnership with SSIR and the Center for Universal Education (CUE) at Brookings.